Discussion in 'iPad General Discussions' started by newbote, Oct 27, 2010. When I run speedtests on my IPAD unless I have line of site to my router I always get significantly worse results than my laptop. When I run the speedtests in the exact location the laptop will come back around 1.9mps download and the IPAD will usually come in worse then .5mps. Is the antennae that much worse or do I have a problem somewhere? I have the most up-to-date software. I would have to say that the WiFi connectivity is one of the weaker points of the iPad. 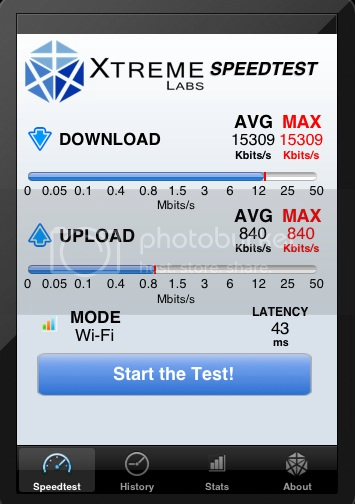 There was a major software change that significantly improved things when iOS 3.2.1 came out, but it still can not match a laptop or desktop with WiFi in a speed test. Is it likely to improve with IOS 4 do you think? I have iOS 4.2 and I have not seen any appreciable difference one way or another. I must have a lemon because my WiFi connectivity has always been pretty good, even before iOS 3.2.1. Must be your router or iPad. I just ran a test and this is what I got. Even in my garage I pull these numbers. Using a netgear G router. Laptop is the same numbers. Plugged in I pull maybe a MB or two faster than over wifi.